In 1975, Louise began her career at Hughes Aircraft Company in the Financial Operations Department. She rose to Chief Financial Officer in 1993. Later, she was appointed Vice President and Chief Operating Officer of Hughes Missile Systems; and in 1996, was named President of Hughes Missile Systems. Louise is a member of the Board of Directors for Stryker Corporation, Director of the TMC Board of Trustees, and Tucson Airport Authority. 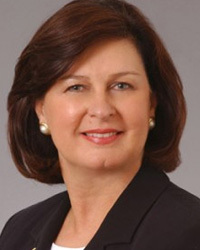 In 2002, Louise was named the Technology Executive of the Year by the University of Arizona Eller College of Management and the College of Engineering and Mines. In 2005, she received a Lifetime Achievement Award from the Women in Aerospace organization; and for three years, Louise earned a spot on the Fortune Magazine “50 Most Powerful Women in Business” list.